Manchester City laid down another statement of intent when they easily defeated city rivals Manchester United 3-1 at the Etihad on Sunday. On the same day, Chelsea and Arsenal were held to draws at home to Everton and Wolves respectively while Liverpool continued their brilliant start to the season thanks to a 2-0 win over relegation threatened Fulham. Elsewhere, Newcastle United and Cardiff registered big wins in their quest to survive relegation thanks to 2-1 victories over Bournemouth and Brighton respectively. On a weekend that saw only five teams victorious, Tottenham Hotspurs are the others who managed all three points as they powered their way past Crystal Palace (1-0) away from home. Here are the 11 players who stood out for me in game week 12. Pickford made four wonderful saves as his Everton side held Chelsea to a 0-0 draw at Stamford Bridge on Sunday. The reflex save to deny Marcos Alonso before half time was the pick of them all as it can only be described as ‘World Class’. RB. Kyle Walker (Man City). Coming up against the pace and trickery of inform Anthony Martial was always going to be an uneasy task but Walker excelled throughout the 3-1 victory over Man United on Sunday. Walker also made eight recoveries, more than any other player on the pitch. Headed home the only goal of the game in a narrow win for Spurs away at London rivals Crystal Palace on Saturday. The goal means that Foyth is the third Argentine player to score for Spurs in the Premier League, after Erik Lamela and Mauricio Taricco. CB. Sol Bamba (Cardiff City). Bamba scored the 90th minute winner as Cardiff defeated Brighton 2-1 on Saturday, the Welish side’s second victory of the season. In addition to his late winner, Bamba made more tackles, clearances and blocks than any other Cardiff player against Brighton on the day. Andy Robertson made more successful passes in the opposition’s half (42) and attempted more crosses (8) than any other player in Liverpool’s win over Fulham. What a player the Brazilian is. At 33, he is still the best defensive midfielder in the league and he proved his case in the 3-1 victory over United on Sunday. On Sunday, Fernandinho had more touches (103) than any other player, and won more duels (seven) than any of his team-mates. MF. 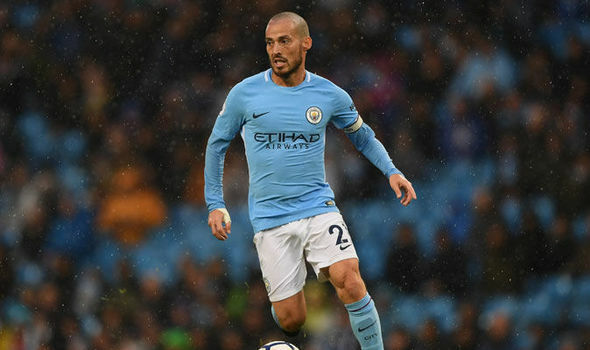 David Silva (Man City). Opened the scoring and, as usual, dictated the tempo of the game in City’s 3-1 win over United. The goal against United means that Silva has now scored in three consecutive home games in all competitions for Manchester City for the first time. MF. Felipe Anderson(West Ham United). Felipe Anderson scored the equalizer against Huddersfield Town on Saturday as West Ham earned an unlikely point at the John Smith Stadium. Felipe Anderson has scored three goals in his past two Premier League games for West Ham, as many as he managed in his previous 24 appearances in the big five European leagues. FW. Bernardo Silva (Manchester City). City’s man of the match in a 3-1 triumph against bitter rivals Manchester United was Silva, who produced a masterful display that saw him register two assists. Despite missing several chances, Salah took his goal brilliantly and was a constant threat for the Reds in their 2-0 victory against Fulham. Against Bournemouth, Newcastle’s Salomon Rondon scored more than once in a Premier League game for just the second time in his career.